There is a MODERATE avalanche danger in the Turnagain Pass region for both glide avalanches as well as fresh wind slab avalanches. 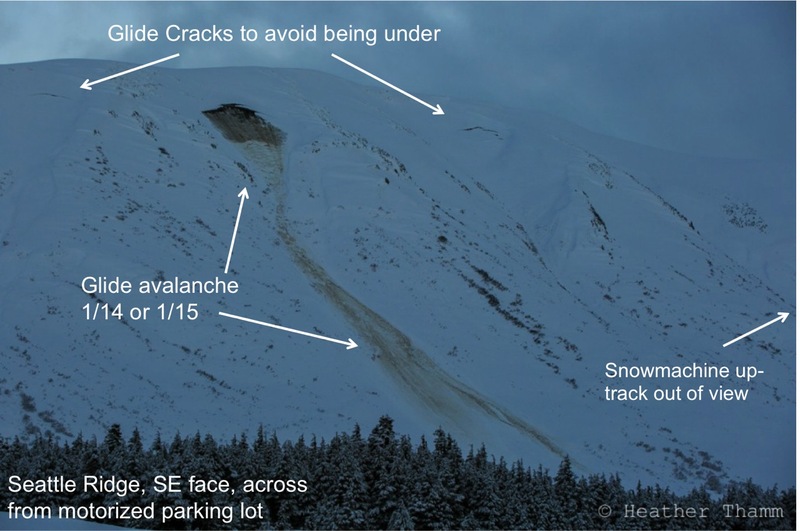 At the mid-elevations (between 1,000' and 2,500') destructive glide avalanches are possible. Several of these have released over the past 3 days and could release again today. In the upper Alpine zones, ridgetop winds are expected to be strong enough to form shallow wind slabs on leeward slopes. If this is the case, human triggered wind slabs will be possible. Note: Glide avalanches are a different 'avalanche beast', they are not something a person can trigger - they release spontaneously on their own. This is why we keep preaching avoidance and limiting exposure under glide cracks, it's a wrong place at the wrong time scenario. More on this below. There are many safe areas to recreate today. These are areas that DO NOT have glide cracks above and slopes that are not being loaded by today's winds. Glide avalanches are stealing the show this week. There have been at least 4 glide cracks that have avalanched in the past 2-3 days (Seattle Ridge East face, Eddies South face, Wolverine South face, Skookum North face). These have been roughly between 1,500' and 2,500' in elevation and on all aspects. If you do the math, the percentage is quite low a crack will avalanche - I counted over 100 glide cracks yesterday from one spot on Turnagain Pass. So 4 out of 100, that's a 4% chance, or less, a crack will release? You can't really do it this way, but the point is, there are numerous glide cracks out there and not all of them will avalanche - but it's just not worth it, these are killers if you are in the wrong place at the wrong time. What can we do about them? Glide avalanches are like crossing a road, you can look both ways or not, it's your choice to expose yourself when cars are coming, or not. They are easily avoided by taking stock of your surroundings. If you can't see what is above you (or below you) then go to a different slope; avoidance and limiting exposure under cracks is the key. The South face of Tincan and the East face of Seattle Ridge are probably the two areas where folks are traveling under glide cracks the most (photos below). 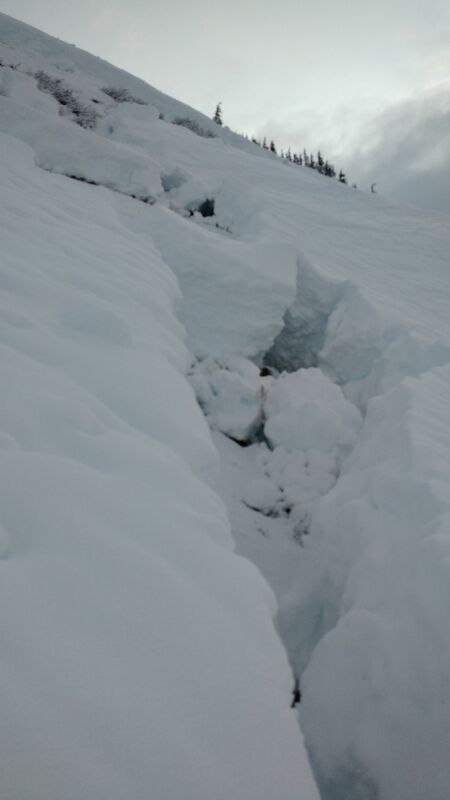 Photo below: Glide avalanche on the Easterly face of Seattle Ridge that ran sometime in the last 2 days. You can see two large cracks on either side of the avalanche. More photos HERE. Photo of the South face of Eddies. This avalanche was not only heard, but seen in action, by the party sending in this photo. See that report HERE. Tracks under several glide cracks on the South side of Tincan, under Common Bowl. Photo below: 8-10' deep glide crack on Tincan under the CFR ridgeline. This is the large crack lower in the trees facing the road. Credit: David Pettry. After several days of calm conditions, the Easterly winds bumped up yesterday afternoon on the ridgetops. We had one report from Sunburst (near the weather station) that these winds were transporting snow. For today, we should see winds bump back up to the 10-20mph range from the East. There is enough snow available for transport that if the winds do increase, we could see shallow slabs form in the higher elevations (6-10+" thick). Watching for active wind loading and areas with wind drifted snow will be key. Also, feeling for stiffer snow over softer snow with your pole or boot can help suss out if winds have created slabs. Partly sunny skies yesterday gave way to cloud cover late in the afternoon. The Easterly ridgetop winds also moved in late in the day. Temperatures were chilly (teens) in the parking lots and 20's F on the ridgetops. Today looks to be mostly to partly cloudy. We are seeing another band of cloud cover being pushed our way by a large low-pressure system spinning South of the Aleutians. The ridgetop winds remain light from the East this morning but are expected to pick up to 10-20mph by the afternoon. Temperatures are in the mid 20's F at 1,000' and the low 20's on the ridgelines where they should remain today. For tonight into Sunday, we could see some light snow showers above 1,000' and rain at sea level. Stay tuned.